Kursaal conference center (lit up, in middle), La Zurriola beach foreground, Parte Vieja and La Concha beach in background. Photo courtesy Centro Kursaal. The city of San Sebastian sits on the northern coast of Spain, on the Bay of Biscay, only a few kilometers from the French border. The city itself spreads from two crescent-shaped beaches – Playa de la Concha and Playa de la Zurriola. The Parte Vieja sits in between. The promenade along La Concha hosts a traditional paseo in the evening, with older couples dressed in their best clothing and strolling hand-in-hand, dodging rollerbladers and bicyclists, with the whole show overseen by guests sipping Txacoli on the open-air patios of the adjacent Belle Époque-era hotels. La Zurriola beach is less formal and more eclectic. There’s a big surfing community here – it’s quite normal to see teenagers and young people in wetsuits and barefoot, carrying a surfboard and traipsing through town towards La Zurriola. Unlike La Concha which is lined with hotels, La Zurriola is lined with apartment buildings, reflecting the residential feel of the adjacent Gros District of San Sebastian. At the southern end of the beach, overlooking the mouth of the River Urumea that bisects the city, are two cube-like buildings perched on an enormous concrete and stone plinth. This is the Kursaal Congress Center. Built in the 1990s as part of a national push to transform Spanish cities from industrial to service/tourism economies, the Kursaal now hosts some of the most prominent cultural festivals in Europe. The San Sebastian Film Festival is now headquartered here, and is one of the most influential film festivals in the world. Started in 1952, filmmakers such as Roman Polanski, Francis Ford Coppola and Pedro Almodovar have all launched careers there. Similarly, the San Sebastian Jazz Festival (the Jazzaldia) takes place in and around the Kursaal (and throughout San Sebastian). 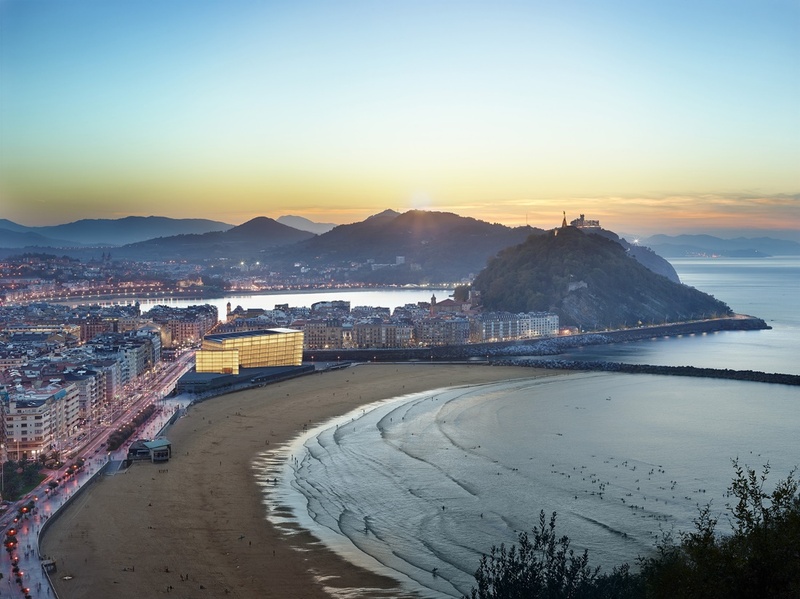 And in 2016, San Sebastian will be recognized as a European Capital of Culture, further distinguishing it as one of the up-and-coming cultural and tourist destinations in Europe. Food, cookery and gastronomy are playing a big part in this. In addition to the historic Tamborrada, one of the biggest yearly events is the Gastronomika in which San Sebastian literally becomes the center for international gastronomy and cuisine. For several days in October, the most famous and renowned chefs from around the world come to San Sebastian to present the latest ideas and techniques in gastronomy. Presented in the Kursaal Center, on a stage that is truly a “kitchen stadium,” in front of hundreds of attendees, the world’s best chefs become rock stars for a day as they hold forth on the stage – cooking, performing, and generally playing to a crowd that not only watches and listens, but also gets to sample the chef’s creations. They’ve all presented here, the great chefs of the world – Adria, Andres, Arzak from Spain; Keller, Bouley, Chang, Boulud from New York, and many others. Perhaps no one represents the rock star status of chefs in Basque country than Andoni Luis Aduriz of Mugaritz restaurant. That an event like the Gastronomika is held in San Sebastian is indicative of the social status of chefs in both San Sebastian and the Basque Country as a whole. Simply put, people who cook food here are considered rock stars. This includes internationally renowned chefs, cooks in the local pintxo bar, members of a txoko, and even home cooks. In San Sebastian, choosing a career as a chef is like choosing a career as a doctor or lawyer in other countries – there’s a prestige factor involved. It’s clearly not like this in other cultures, and this is one of the most important reasons why San Sebastian has become the world’s greatest food city. The fact is that even in the most advanced, cosmopolitan cultures, choosing a career as a chef is not as prestigious as other professions like doctors and lawyers. In some cultures there is even an unspoken stigma associated with cooking as a profession (especially for men). In San Sebastian and the Basque Country, chefs and cooks are lionized. In other European cultures, young people may dream of one day becoming a professional footballer or movie actor. No doubt this is the same among young Basques, but the status of the chef as a profession isn’t far behind. This is especially applicable to young men. In other cultures, like it or not, cooking is seen as something women do. 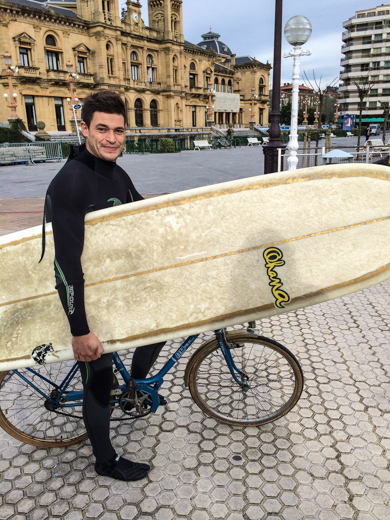 In San Sebastian, young men see chefs (most of them male, admittedly) as role models. The tradition of txokos as male-centric organizations further de-stigmatizes the profession of cooking for young men. But as a new generation of Basques takes the helm at celebrated bars and restaurants, women are taking an even greater role in the day-to-day culinary work of San Sebastian. As an example of both the generational and cultural transformation of food in San Sebastian, look no further than the restaurant that is the origin for what has come to be known as the New Basque Cuisine – Arzak.